Between 2005 and 2015, the annual rate of content creation has increased 2X to 4X; in music, the growth rate is 10X annually. Distribution platforms have grown by 10X since 2009; there are 10 times more places creative content can be found. Media tech budgets increase just 3 – 4 % per year; and need to cover delivery to more platforms, data security and monetizing content over its lifetime. Content consumers (listeners, viewers, players) only consume 50% more content now than 10 years ago: the choices are overwhelming, the sources of content proliferate; yet we still only have two ears, two eyes, and 24 hours in a day. 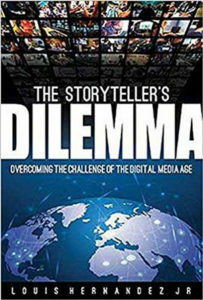 You can see the problem: The storyteller’s dilemma is how to make a living in an environment of overwhelming abundance of options for the audience, many of them free or effectively free. Those of us working in the creative economy have been feeling the problem since the advent of Napster; what’s different here is that Mr. Hernandez proposes a way out. The reviews of this important book often call it a dry read, and while I got a lot from the 45-minute Powerpoint version Mr. Hernandez presented at NAMM, I appreciated having page after page of infographics to explain parts of the digital media industry that I don’t work in, and that he took the time to drill down into issues as they affect different players in the industry. Because of who he is in the industry and the potential effect of his proposed solution, it’s worth taking the time to read. Mr. Hernandez takes the time to describe the media “value chain” – every step from creation through distribution and monetization—and how its institutions and practices, established just in the 20th century, have persisted in the face of digital disruption, wasting resources on redundant workflow, repetitious tasks and proprietary systems that don’t add value to the creator-listener connection. Streamlining and standardizing the non-creative steps frees revenue that can be better invested in content creators and their works, without reducing profits. 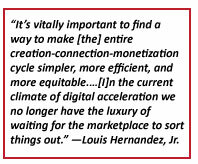 In the final section of his book, Mr. Hernandez makes his case for a common platform via which media companies and creators themselves can perform the crucial background tasks that help content retain its value. Examples include metadata tagging, DRM, creation and delivery of masters in multiple formats, and digital storage and retrieval. And this is what makes the message from this particular writer so important: Mr. Hernandez has a unique perch in the industry, where his products indeed influence the entire value chain. His point: if we were creating these digital media systems from scratch rather than building on top of legacy systems, we would expect to have standards and shared services on which any part of the industry could rely. • Open standard – an industry-wide, agreed-upon and published definition for anything from file formats to communications protocols to processes, accessible to all. Any product or service that adheres to a given standard will be compatible with any other that also complies. Remember when the USB standard solved the disorder of peripheral-to-computer interface? Mr. Hernandez doesn’t propose to make, say, ProTools with 70% of the market the standard, but, he says, a creator can choose the best DAW or editor, confident that the work output will integrate with lower-cost shared back-end tools for tagging, storage, DRM, etc. • Open source – a licensing scheme that prevents users of intellectual property from profiting by reselling it, a legal framework. An example is Linux which, because it was open source, encouraged companies to develop innovative app software, and is now a robust platform for business computing. • Shared service – a utility or function that is accessible to all so that people need not create it themselves; they may or may not be free to use, but they guarantee consistency and compatibility. I’m thinking now of SoundExchange, developed to handle creator compensation for certain forms of digital media, expandable to cover the mandates in the prospective Music Modernization Act. *I checked in on the hashtag – not a lot of action so far, but let’s see if it helps rally around the Music Modernization Act.